MICHELLE KELLY is a writer living in Coventry, UK. Her recent Harlequin crime novel When I Wasn’t Watchingwent to number 1 in the UK and Australian crime charts. She is a passionate yoga practitioner and finds that, as the mother of two teenagers, her yoga practice keeps her sane. 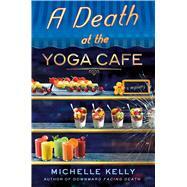 The Keeley Carpenter stories marry her three great loves; yoga, food, and murder mysteries.